A perennial is any herbaceous plant that will survive for more than 2 years in the proper environment. If you think that vegetables are all annuals that need to be planted each year and fruits all grow on woody trees, think again. There are a number of perennial vegetables and fruits that you can plant once and harvest from for years to come. Why Plant Perennial Fruits and Vegetables? Are you interested in growing your own healthy food, becoming more self reliant, saving money, and planning for the future? Then you should be interested in perennial crops. Your initial investment of time and money will reward you for years to come. Prepare your perennial beds properly, water and weed your plants, top dress with compost, and you will harvest fresh food for your table year after year. Although you need to provide proper soil, water, and sunlight for best growth, most of these plants will eek out an existence and provide you with nutrition even if neglected. So planting some, or all, of these perennials will provide you with food insurance through the possibility of tough times ahead. What if you just can’t get your regular crops in the ground due to illness or weather? Perennials will come through with nutritious fruits and vegetables. With a little bit of extra work, you can raise enough of these vegetables to can, freeze, or dehydrate for sustenance through the lean times of the year. Propagation will allow you to turn a few plants from the nursery into a nice sized bed of edibles. Walking onion growing from bulbils. A vegetable is any edible part of a plant, other than the fruit. Carrots are vegetables, but tomatoes and peppers are technically fruits. The following is a list of some common vegetables that come back year after year. This delicacy likes sandy, well drained soil in a spot that receives at least 7 hours of sun. It thrives in areas with a cold or dry dormancy for part of the year. 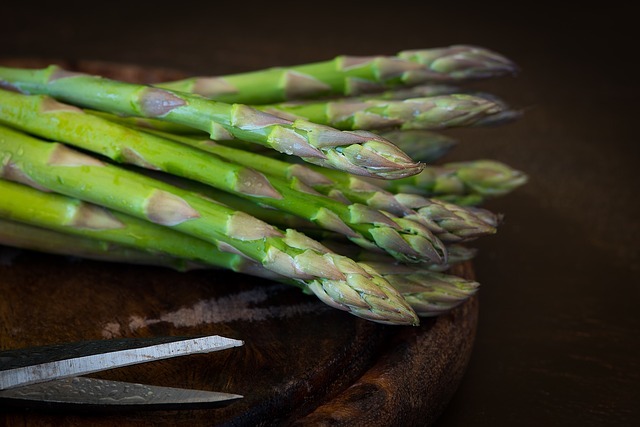 Before planting asparagus crowns, thoroughly clean out all weeds and work in compost. Loosen soil to about 12″ deep. Each crown should be planted 12″ apart in rows 4′ apart or more. Dig a trench about 8″ deep and mound the soil up into a small hill for each crown. Spread the roots around the mound and cover with soil. Add soil or compost periodically to slowly mound up the crown. Water for the first two years and side dress with compost. Wait until the third year to harvest your first spears, and leave some stalks to grow the rest of the summer. 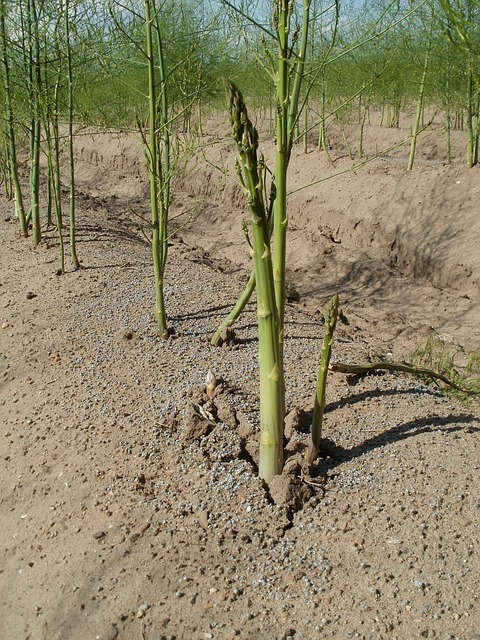 Asparagus crowns will remain productive for 20 years and will propagate from seeds. Often called bunching onions or Egyptian Walking onions, these members of the alium family can be eaten at any stage of growth. They have a pungent flavor and can be used as green onions, bulbs, or the small bulbils can be used as pearl onions. 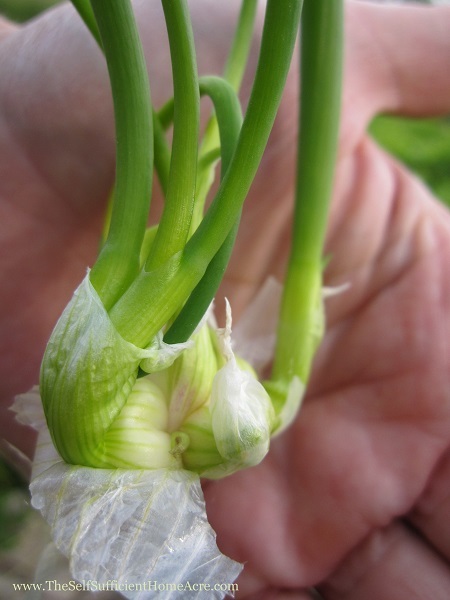 Plant the bulbils out in a row to harvest over an extended period of time as young green onions. As they get larger, they will produce a small top set of bulbils and the original bulb will become woody. Another onion will grow from the same root to carry on the next generation. These onions are very hardy and not at all picky. Provide them with decent soil and plenty of sun for best results. They are one of the first plants to green up in my garden each spring and the last to be harvested in the fall. Usually grown for its pungent root, this perennial vegetable can also be utilized for it’s spicy greens. They have a tendency to take over a garden bed, so choose your spot wisely. Plant roots in the spring or fall in loose, well drained soil in a sunny location. Let your horseradish grow for two years before harvesting in the fall after leaves turn brown or in the spring before new growth appears. 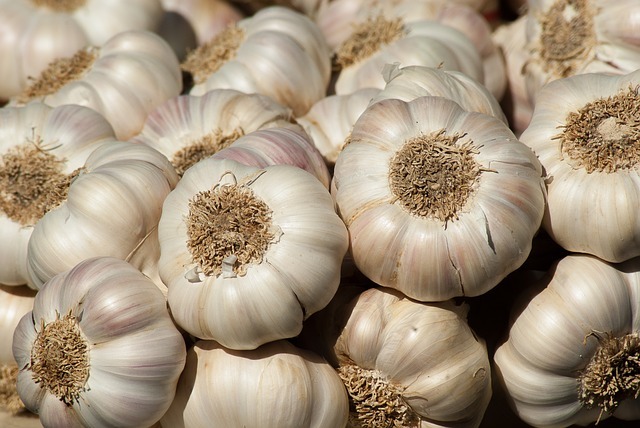 Every fall, as you harvest your garlic bulbs, replant some of the cloves for a crop the following year. Choose a sunny, well drained spot in the garden. Work in some compost as you harvest and replant. In the spring, clip off the scapes, or young flower shoots, to encourage larger bulbs. Store garlic in a cool dry place to use in the winter. This pretty flower is not an artichoke, nor is it related to them. 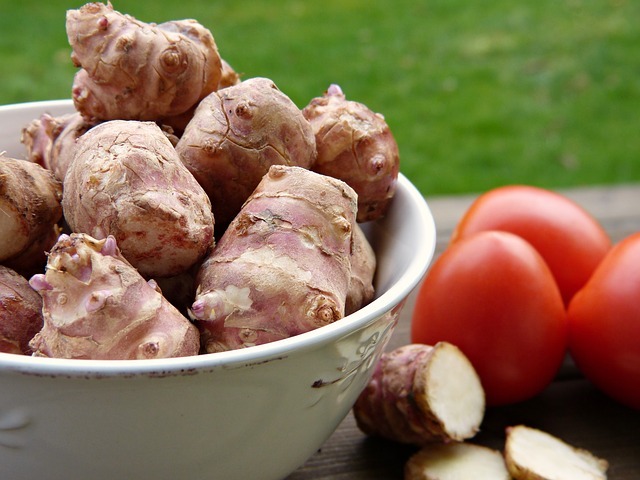 It does produce a crisp, starchy root that can be used in place of water chestnuts for a veggie stir fry, or it can be cooked and chopped into salads. The flowers are very tall, towering overhead, and need full sun. It’s hard to get rid of these plants once you put them in a bed, so choose your spot wisely. This green leafy has a lemony flavor that adds zing to early spring dishes. It is one of the first vegetables I harvest from my garden in the spring, when I’m hungry for homegrown salads. Although I have yet to try the following perennial vegetable crops, I have read that they are wonderful additions to the kitchen garden and will provide you with fresh greens for many years. I hope to try some of these soon so I may share my experiences growing, harvesting and cooking these healthy plants: Ground Nut, Good King Henry, and Sea Kale. For those in more southerly climate, you can add artichokes to the list. 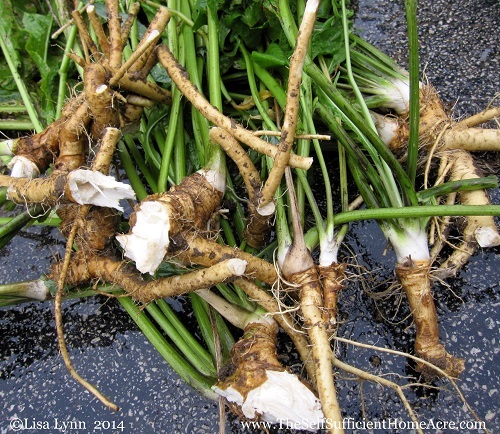 Eric Toensmeier, author of Perennial Vegetables, tours his perennial root crop. 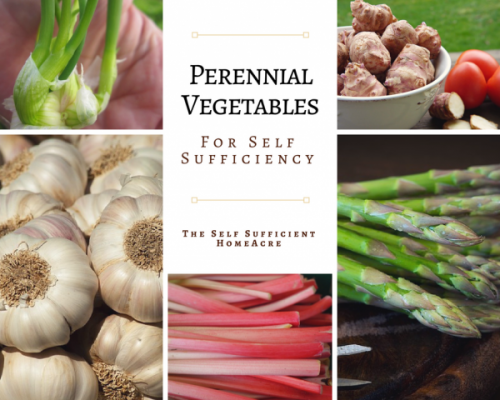 Do you grow perennial vegetables? Would you like to add more to your garden? We have beans that come up every year over a frame over our sandpit – provides shade in the summer for my little boys, looks pretty, and grows a LOT of beans! Then there’s rhubarb, raspberries, gooseberries, black and red currents, asparagus (which has one more year to grow a good crop, otherwise it’s coming out), silverbeet and herbs. Sounds wonderful! I haven’t had beans come back, but then I probably picked every last bean! When you plant asparagus you want to give it 3 years to become established before you start harvesting. Otherwise it can’t put the energy needed into growing a good root system. It’s tough, I have some beautiful spears coming up in my garden and it is taking every ounce of will power to leave them alone! Best wishes! I definitely want some perennial garlic and onions going on in my property! My Grandma has some garlic that grows every year near her garage. It’s great because she loves garlic, but is too elderly to keep up with a garden. What a blessing! Thanks for the list, I’ll have to give them a try! I adore perennials! I love garlic too! 🙂 You would love the perennial onions…and they are so healthy for you too! Your Gram sounds like a wonderful lady…it’s great that you have her in your life! Last year I grew Red Malabar Spinach in a pot. It is a perennial in warmer climates. It is not a true spinach – it vines! It is pretty, has a good flavor and is prolific both in growth and seed producing. I found the seed at Seed Savers Exchange in Decorah, IA, and since then have found that Earl May carries the Seed Saver seeds in their stores. I also grew an artichoke from seed. It got large enough to produce one small bud. We are not yet warm enough this Spring for me to tell if will come back, but I am hopeful. I have designated garlic and asparagus beds, and planted concord grapes and blueberries 3 years ago. I am a wannabe homesteader in the suburbs. That’s awesome, Mary Jo! I always love to hear how people are becoming more self sufficient in suburban and urban areas! Thanks for the info! I don’t have any experience with growing in warmer climates. Hi Daisy! 🙂 Glad they make you happy! We planted some artichokes this year, mmmmm….. We plan on planting some asparagus, but we didn’t have time to make a good bed for them this year, so we will have to wait. The one I am most interested in lately is the sea kale. I heard that it tastes almost exactly like broccoli, but is much less of a hassle to grow! I’ve never heard of an egyptian walking onion – almost sounds like a character in a children’s movie! I can’t wait to do some research on that one next! What does it taste like? Is it actually an onion or a scallion? I learn something new every day from all the wonderful blogs I read! I’m just loving this blogging thing! I’ll have to check into the sea kale. I love broccoli, so I’m sure I’d like the kale too! The walking onions are onions, but then they are all members of the allium family and are closely related. These don’t get a large bulb like you would think of with regular storage onions, however. They have a very strong onion flavor. Great for cooking. Thanks for stopping by! Best wishes with the artichokes and future asparagus! Thanks so much for sharing these ideas. We’ve been focusing on planting trees and perennials on our new homestead before majoring on seasonal vegatables as they are more sustainable. Most of our edible landscaping is perennials. I really want to try the Egyptian Walking onions you mentioned. Good for you! It’s so wonderful to have the trees and plants that keep giving back every year! I know you would like the onions…they are great chopped up in food for a real punch of flavor! We have horse radish plants we got from our father in law we love them! They are invasive so they are in a very special garden plot with other invasive plants that are all compartmentalized 🙂 Great post! Great post, it took me a while to realise that perrenials had a place in my garden, and would reduce the amount of work as well. I have a few beans that grow back, for a few years anyway, lablab is the main one. And raspberries, blackberries, strawberries, ginger, tumeric, lots of herbs, Jerusalem artichoke, arrowroot, sweet potato…… I just keep adding more! Farmer Liz, could you tell me about your perennial beans? That sounds fascinating. What kinds are they? Do they just come back up each year? Or do you replant tubers or something like that? She might not see your comment here 🙂 She lives in Australia and has a great blog that I’m sure you would enjoy reading! Great article-thank you! Do have rhubarb, and planted leeks 2 years ago. The leeks came back the next year. Love your blog. Thanks so much Arlene! 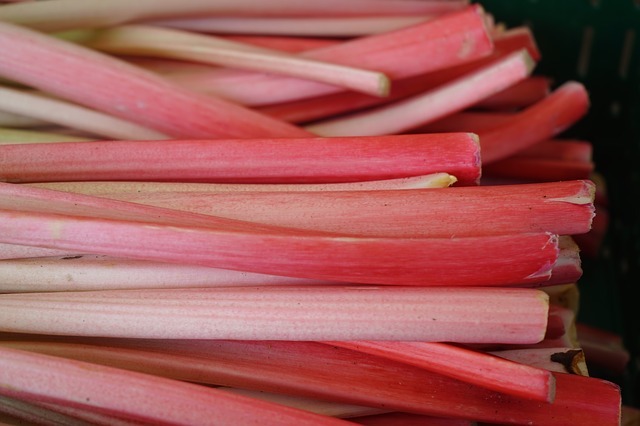 Enjoy the rhubarb…that should be coming up in the garden now. 🙂 Are they wild leeks? I used to dig the wild leeks in the woods when I was a kid. Thanks for visiting! I’ve wanted rhubarb since I moved to WV over 7 years ago and the one time we tried to start asparagus the pigs dug it up! Now that we’re on our new farm we’ll be planning where to put these two in. I may even have a place to plant Jerusalem Artichokes where I don’t have to worry about them being invasive! We’ve done asparagus, and have yet to put some in here. I have not yet tried horseradish but I know it is supposedly a good companion plant for potatoes so when we decide where the potatoes are going to go eventually, I’ll put some in. 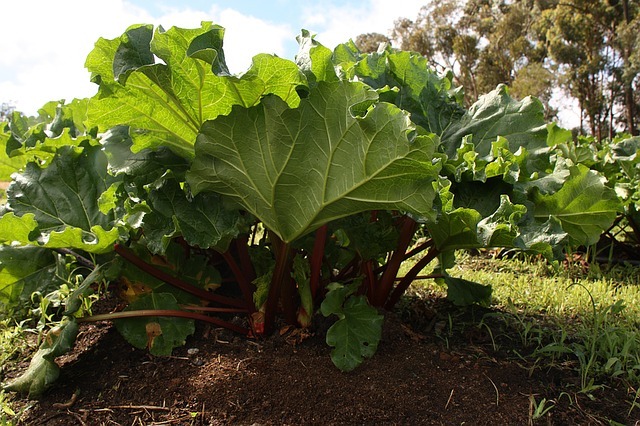 Supposedly rhubarb does not grow in our climate but I have yet to actually try it myself. It’s tough to get it all going when you are getting started. I’m sure you will have plenty of new plantings before you know it! Rhubarb doesn’t like hot, dry environments…so that might be correct. GREAT info! I love perennial flowers in the garden so they keep coming back year after year, but I don’t do much with vegetables. Maybe one day! You can work a few perennial veggies into your flower beds too! My Mom used to have asparagus growing in a flower bed, until I ate it all and didn’t leave any to store up energy. I was a little rabbit!